US equity futures rose slightly as European shares rebounded after Asian equity markets opened on Thursday in a sea of red as investors expressed growing concern over the deepening emerging market sell-off, before recovering slightly later in the morning even as Trump was preparing to launch a new trade war with China, announcing another $200BN in Chinese tariffs. While focus remains on efforts from Argentina to Indonesia to sustain confidence, the potential for President Donald Trump to announce another round of tariff hikes on Chinese imports as soon as Thursday also looms large. Traders were skeptical about taking on more risk ahead of tomorrow's U.S. jobs report, most saw more pain for developing nations, particularly with President Trump set to follow through with a plan to launch another $200 billion of additional tariffs on Chinese imports after a consultation period ends Thursday. Meanwhile, China warned again that it will be forced to retaliate, if the U.S. ignores resistance in public hearings and imposes additional tariffs, said Gao Feng, a Ministry of Commerce spokesman, at a briefing on Thursday in Beijing. The two nations have maintained contact on a working level since Vice Commerce Minister Wang Shouwen visited the U.S. last month, Gao said. 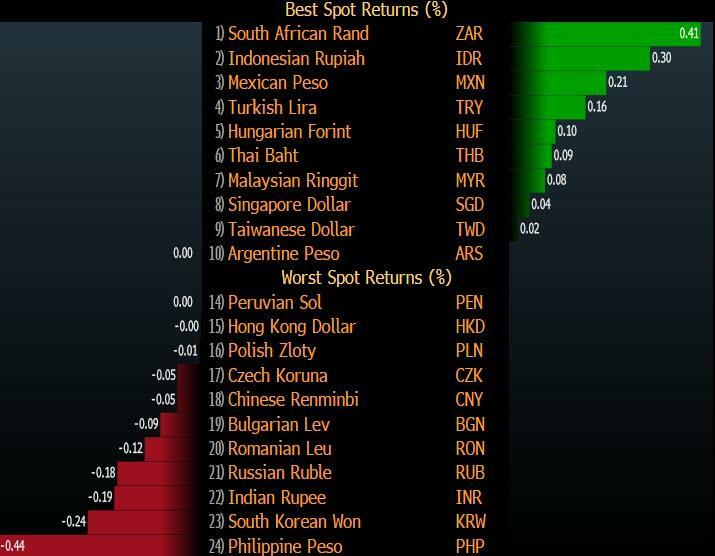 The good news is that the rout that has roiled emerging currencies took a breather on Thursday, as the Turkish lira and South African rand led a recovery in emerging market currencies resulting in a modest stabilization in EM FX, helping support risk assets across the board with only the Philippine peso sliding. The South African government reiterated plans to reform the economy which supported ZAR, helping push TRY and MXN higher. Offsetting this was the AUD, which was pressured overnight as 2 more of the large banks raise mortgage rates; Elsewhere, the SEK weakened after Riksbank priced out an Oct. hike and hinted that the first hike could take place in 2019. The offshore yuan rallied mid-European morning, driven by reports of a major Chinese bank buying in shorter end of the forward curve, similar to prior moves taken to limit yuan depreciation. And while emerging currencies reversed losses helped further by a dip in the dollar which brought some relief, as did a gain in copper prices, the MSCI Emerging Market Equity Index dropped for a seventh day, and was on the cusp of a bear market down just why of 20% from its January highs, with few signs of relief from a sell-off that’s battered developing economies around the world. Analysts are now questioning whether the rout merely reflects a series of one-off hits or indicates the beginning of a broader malaise. 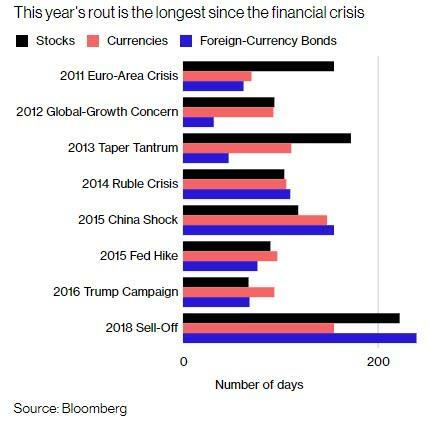 As noted yesterday, the rout across emerging markets is now the longest since the global financial crisis, or specifically 222 days for stocks, 155 days for currencies, and 240 days for local government bonds. The duration of each selloff - as calculated by Bloomberg - had taken even the most ardent bears by surprise because "not one of the seven biggest selloffs since the financial crisis - including the so-called taper tantrum - inflicted such pain for so long on the developing world." On Thursday, Asian stocks opened broadly lower as tech sectors were pressured by yesterday’s Nasdaq sell-off. China’s CSI 300 index of mainland listed companies opened nearly 2% lower, following disappointing data released on Wednesday on China’s manufacturing sector and ahead of potential new trade tariffs imposed by the US, before paring losses later in the day. The Shanghai Composite dropped back under 2,700. Indonesia’s stock market also came under pressure as overseas investors have withdrawn some $3.7bn from the market so far this year, according Bloomberg data, pushing the Jakarta Stock Exchange Composite index down 10 per cent year-to-date. In Japan, the Topix index opened the day 0.7% lower, after a 6.7 magnitude quake struke the northern island of Hokkaido. Stocks in the Philippines were the biggest decliners across the developing world after inflation exceeded 6 percent for the first time since 2009. Although Asian markets have so far fared better than their EM peers, analysts quoted by the FT cautioned that the region has its own problems. Morgan Stanley analysts said the stable renminbi had bolstered Asia over the past month, but added that “risks are building” in Asian currency markets. 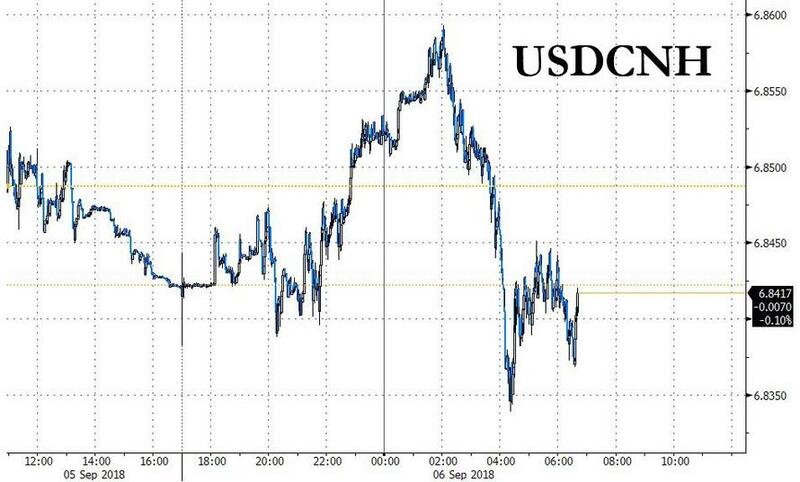 They said a pick-up in trade tensions would “not help these markets either”, but pointed out that the impact could be mitigated to some degree if the People’s Bank of China managed to keep the renminbi in check. 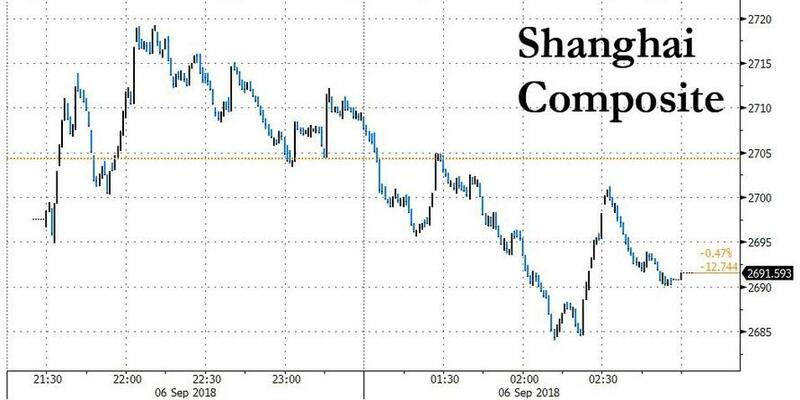 “The momentum right now is quite strong, so you don’t want to stand in front of it,” said Tai Hui, chief market strategist for Asia-Pacific at JPMorgan Asset Management. Elsewhere, European equity markets opened lower but ground back to flat as the Stoxx Europe 600 Index shook off two days of declines to trade little changed with Italy’s FTSE MIB (+0.4%) outperforming in a continuation of the trend observed in the past few days, while Spain’s IBEX (-0.6%) underperforms, weighed on by financial names with the IBEX 35 banking sector down over 1%. In terms of stock specifics, Safran (+6.1%) shares flew to the top of the Stoxx 600 following an impressive upgrade in guidance. Metal futures also bounced from recent lows with Copper future +1.8%, although the risk on mood may not last long: according to Bloomberg, European stocks are acting more and more like emerging markets as the correlation between the regions’ equities has been on the rise, climbing to 0.6 from 0.3 in June. Futures on the Dow, S&P 500 and Nasdaq also pointed to a firmer open. Ten-year Treasuries climbed and European bonds were mixed. In G-10 FX, havens led the way amid concern President Trump will order additional tariffs on China. The dollar slipped and Treasuries edged higher before tier-one data out of the U.S. Emerging markets and European stocks consolidated. The Swedish krona came under pressure after Riksbank said October isn’t a live meeting any more. Elsewhere, the pound climbed after being whipsawed amid Brexit discussions. Gold advanced with copper. Bitcoin dropped after a report that Goldman Sachs was said to delay setting up a trading desk for cryptocurrencies. In geopolitical news, a UK naval ship carried out a freedom of navigation operation near Chinese-controlled Paracel Islands in South China Sea, while reports added the ship did not enter China’s territorial waters but the actions suggested it doesn't recognize China's excessive claims on the region. There were later comments by China Foreign Ministry that the Royal Navy ship entered its territorial waters and that the Chinese navy warned it to leave, while it added that the UK should avoid provocative actions. South Korean official stated that a summit will be held with North Korea on Sept. 18th-20th in Pyongyang to discuss practical measures for denuclearization of the peninsula and that North Korea Leader Kim reaffirmed commitment to denuclearization. The official added that North Korean Leader Kim expressed intent to cooperate closely with US and expressed regret over international community's doubts of his will to denuclearize, while North Korean Leader Kim a also said that nuclear tests have become permanently impossible after the test site was dismantled and that he no longer intends to conduct long-range missile tests, while Kim's trust in US President Trump is unchanged and is said to want to realize denuclearization during Trump's first term. Today key event, of course, is the deadline for the end of the public comment period concerning another potential round of tariffs on $200bn of China imports. Most economists believe the impact on China will be manageable, as officials have space to ease policy. There are however risks to the upside, if a positive trade deal is reached, which would see higher rates, a strong yuan, and less infrastructure spending. In commodities, WTI and Brent futures traded marginally higher following yesterday’s retreat to below the USD 69.00/bbl and USD 77.50/bbl levels respectively (with the latter reclaiming the level in recent trade). The weekly API inventory report showed a smaller than expected draw in headline crude stockpiles with a muted reaction in the oil market. News flow has been light for the complex thus far. In terms of NHC updates, tropical depression Gordon continues to drift through Western Mississippi, threat of heavy rains and flooding will continue for several days, while Hurricane Olivia and Florence remain strong albeit still away from land. Traders will keeping an eye on the delayed weekly EIA crude inventory report due at 1600BST/1100EDT. The metals complex is broadly benefitting from the pullback in the dollar. Copper outperforms its peers amid upside in Chinese commodities. Thursday Expected data include jobless claims and factory orders. Broadcom, Dell Technologies, Marvell Technology, and Palo Alto Networks are among companies reporting earnings. Trump on possible government shutdown at the end of the month: "If it happens, it happens"
Riksbank holds rates at -0.50% as expected; tweaks rate path by ruling out Oct. hike and signaling first hike in Dec. or Feb.
Asian equity markets traded mostly lower after a similar lead from US where the Nasdaq underperformed and the tech sector saw its worst performance in over a month as social media executives testified at Congress. ASX 200 (-1.2%) and Nikkei 225 (-0.4%) were negative as Australia mirrored the tech rout stateside and with sentiment in Japan was dampened after the Hokkaido region was hit by a powerful earthquake which triggered large landslides and mass power outages. Elsewhere, Hang Seng (-0.7%) and Shanghai Comp. (flat) both opened lower although the latter then found support just below the 2700 level after stock-supportive measures including a proposed regulatory revision to permit more stock repurchases and with interest income from loans to smaller firms to be VAT-exempted. Finally, 10yr JGBs were higher with prices underpinned by the predominantly risk-averse tone in the region and amid the BoJ’s presence in the market in which it upped its purchases of 5yr-10yr maturities. In FX markets, the DXY remained subdued and tested the 95.00 level to the downside as its major counterparts initially extended on recent gains with EUR/USD briefly fuelled after it tripped through stops at the prior day’s highs around 1.1640, while GBP/USD found a base at 1.2900 and held on to the majority of the advances spurred by the recent Brexit-friendly headlines. Elsewhere, JPY firmed against the greenback with the currency spurred by safe-haven and repatriation flows following the Hokkaido earthquake, while antipodeans initially traded higher in which AUD/USD and NZD/USD briefly reclaimed the 0.7200 and 0.6600 handles respectively, but then pared the moves with AUD pressured after more of Australia’s big 4 banks hiked mortgage rates and effectively reduced pressure on the RBA to start tightening policy. Commodities were mixed overnight with WTI crude futures subdued following the prior day’s retreat to below the USD 69.00/bbl level and after the weekly API inventory report showed a smaller than expected draw in headline crude stockpiles. Elsewhere, gold initially benefitted from a weaker greenback but then met resistance at USD 1200/oz, while copper outperformed the commodity complex amid upside in Chinese commodities. In the US it’s a fairly packed calendar with the August ADP employment change reading due along with final revisions to Q2 nonfarm productivity and unit labour costs, the latest weekly initial jobless claims print, final August services and composite PMIs, August ISM non-manufacturing, July factory orders and final July durable and capital goods orders data. Keep an eye on potential trade headlines given the deadline for the public comment period on the next round of tariffs. find a replacement for my iWatch. I’ll be interested to hear of your fascinating long service awards if you have any. Talking of tech, we wondered in our week ahead whether yesterday’s Congressional hearing with the main tech companies on social media and foreign influences on elections would be a big event. In some ways it was as it finally started to drag US equities down into the risk off mood that it had recently been immune to. However, in broad terms US stocks still outperformed and outside tech most sectors edged higher. Europe saw significant underperformance. Meanwhile the EM sell off continued but moderated a bit and Italy continued to out-perform. Elsewhere the headlines turned more positive on Brexit and the Pound saw a big intra-day swing. So lots going on. Expanding on these themes now. Firstly the NASDAQ tumbled to a -1.19% loss by the end of play last night which was the biggest fall for the index since July. The NYSE FANG index also fell -2.76% (most since July 30) while Facebook, Twitter and Alphabet – executives of which were testifying at Capitol Hill - were down -2.33%, -6.06% and -0.88% respectively. The S&P 500 was down a more sedate -0.28% with 285/505 stocks rising while the DOW actually clawed back to a small +0.09% gain by the close. It’s worth noting that DB’s US Equity Strategist Binky Chadha published an update on Tuesday with his views into year end. Binky still has a 3000 target for the S&P 500 (current 2888.60) but believes that there are a number of reasons to be cautious in the near-term with the window for a 3-5% pullback open, especially with September usually seasonally weak. Thereafter Binky is a lot more constructive from October into year end. Meanwhile Europe again was the material underperformer yesterday with the STOXX 600 finishing -1.09% (-1.72% lower this week) and the DAX closing down -1.39% for a fifth consecutive daily loss. That’s the longest losing run since the late January/early February sell-off for the DAX. EM equities shed -1.77%, taking their losses since last Wednesday to -4.47% and -19.74% since their January peak. They did briefly step into bear market territory intra-day though. EM currencies stabilised a bit, trading up +0.16% and closing higher for only the second time over the last eight sessions. The Turkish Lira actually rallied +1.06% while the Argentine Peso gained +1.23%. Media outlets reported that IMF Managing Director Lagarde indicated to Argentine President Macri that expedited disbursements are likely. The South African Rand was down a much less eye watering (relative to recent moves) -0.51%. Once again the big outlier in European markets was Italian assets. The FTSE MIB (-0.09%) was close to unchanged while 10y BTPs ended 8.3bps lower. That’s in the context of a +2.3bps move for 10y Bunds and flat day for Treasuries. Newsflow out of Italy has turned incrementally more positive with each passing day this week with PM Conte the latest to speak, saying yesterday morning that talks have been “very productive” and that the budget law will keep finances “in order”. Deputy Prime Minister Salvini, head of the League, said “we want to respect the commitments made, with the Italians remaining within the constraints imposed by others,” suggesting that he now plans to avoid confrontation by respecting previous government’s fiscal plans. We will see. A quick look at Asia this morning where the risk-off tone has continued for the most part. 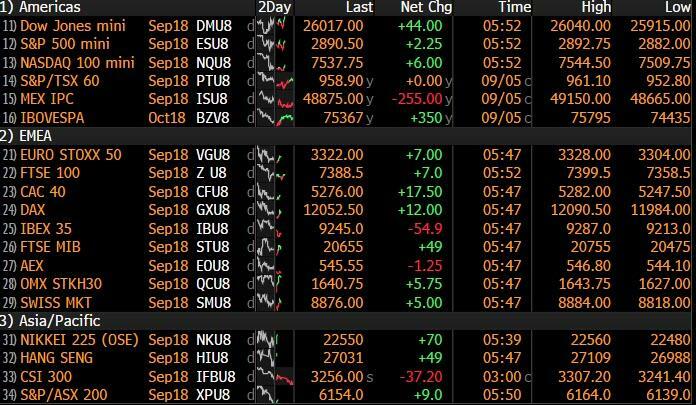 The Nikkei (-0.28%), Hang Seng (-0.64%), Kospi (-0.02%) and ASX (-1.08%) are all in the red although the Shanghai Comp (+0.17%) is still holding onto gains. US equity futures are a little weaker while EM FX is broadly stable. As for newsflow, North and South Korea have agreed to hold a summit later this month (18th-20th) with Kim Jong Un quoted as saying that he is open to accepting “stronger” denuclearization measures, so long as the US acknowledges measures North Korea has already taken. Elsewhere JGBs are little changed after the BOJ’s Katoaka (a known QE hawk) said that the BoJ’s move to allow more flexibility in yield movements will delay achieving the 2% inflation target. Staying with Asia, today marks the deadline for the end of the public comment period concerning another potential round of tariffs on $200bn of China imports. Our China Chief Economist Zhiwei Zhang believes that the impact on China will be manageable, as officials have space to ease policy. In their base case, they expect further trade confrontation, looser monetary policy, a weaker yuan, and a fiscal boost to infrastructure spending. There are risks to the upside, if a positive trade deal is reached, which would see higher rates, a strong yuan, and less infrastructure spending. Moving on. The big story here in the UK yesterday was a Bloomberg article which hit the screens in the early afternoon suggesting that the UK and Germany had dropped key Brexit demands and were seeking a watered down version of a future agreement for now to push through the process and avoid a no deal. Indeed the story said that Germany “is ready to accept a less detailed agreement on the UK’s future economic and trade ties with the EU” and the UK side “is also willing to settle for a vaguer statement of intent on the future relationship” including “postponing some decisions until after Brexit day”. The story went as far as to say that an initially planned document of up to 100 pages could now just be a tenth of that. So signs of a classic fudge or at least scope for such with any big decisions pushed back to avoid the risk of a no-deal. As always with these stories there’s a question of source reliability but perhaps there’s also no smoke without fire and the more than 1% rally for Sterling from the lows on the back of it showed that the market took some notice. The Pound was actually a little off its intraday highs (closed +0.39% vs. USD) after Reuters reported a German government spokesman as saying that Germany’s position is unchanged. That didn’t seem like a great surprise though and crucially the comment didn’t explicitly refute the earlier story. Elsewhere the economic data didn’t move the dial particularly for markets yesterday but for completeness the final August PMIs in Europe mostly confirmed the flash estimates. The Eurozone composite PMI printed at 54.5, up 0.1pp from the flash estimate, though readings in France and Germany were revised down 0.2pp and 0.1pp to 54.9 and 55.6pp, respectively. Readings in Spain and Italy came in at 53.0 and 51.7, with Italy’s slowdown in particular raising some concerns as it fell to a 22-month low. Away from Europe, the other standout PMI was in South Africa, where the index dipped further into contractionary territory to 47.2, a 29-month low and comes after data on Tuesday signalled a recession. In the US, the July trade deficit was broadly in line with expectations at -$50.1 billion. Notably, the bilateral deficit with China rose to a new all-time high, at -$36.8 billion. As far as the day ahead is concerned, shortly after this hits your emails we’ll get July factory orders data out of Germany followed closely by the August construction PMI. In the US it’s a fairly packed calendar with the August ADP employment change reading due along with final revisions to Q2 nonfarm productivity and unit labour costs, the latest weekly initial jobless claims print, final August services and composite PMIs, August ISM non-manufacturing, July factory orders and final July durable and capital goods orders data. Meanwhile the ECB’s Lautenschlaeger is scheduled to speak in Vienna around lunchtime while the Fed’s Williams is due to speak in the afternoon. As mentioned earlier keep an eye on potential trade headlines given the deadline for the public comment period on the next round of tariffs.